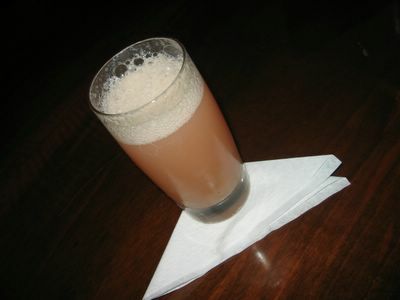 Harry’s Bar created the Bellini – that most delicious cocktail of prosecco and puréed white peach flesh. 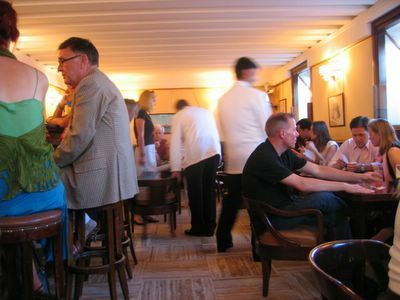 Today it is still a fantastic bar, attracting tourists from all around the world (mainly the US, it would seem) to try their famous cocktails and wonderful service. And when I say wonderful, I do mean wonderful. There is absolutely no pretention or rudeness in their manner; they're fast, friendly and efficient; and if you happen to whip a camera out (and believe me, everybody does), they'll come over and take a photo of you. 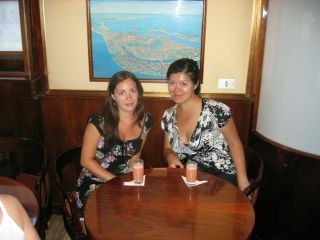 You may be interested to know that we eschewed a gondola ride in favour of sampling the original Bellini. We were on a budget, I'd done the gondola thing the last time I came to Venice, and Clarice really, really wanted a Bellini. They're so deliciously refreshing! We definitely made the right choice. Oh my god another green with envy moment. I love the bellini! We made a few last summer eating antipasto in our back yard. I plan to do it again this summer. How I love prosecco.